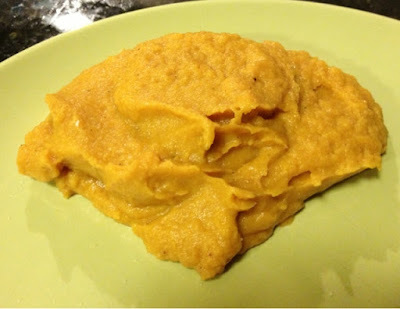 Healthy Fit Goddess: Sweet Potato Mash for Thanksgiving! Happy (almost) Thanksgiving! What are you doing for the holiday weekend? I'm spending it with my boyfriend's family in the suburbs of Chicago. I offered to bring a healthy side dish this year and so I experimented with a mashed sweet potato recipe last night and tested it with Ryan. The first try was kind of bland so I added more spices and it came out really good! This recipe only takes minutes to make and can feed plenty! Again, the picture below doesn't look that good because my plates are green but I promise it looks more appetizing than in the picture! Bring a large pot of water to a boil and add chopped sweet potato. Boil for about 5 minutes, or until sweet potato is tender (test with a fork). Drain the sweet potato and add the rest of the ingredients. Mash by hand or use a food processor until the mixture is smooth. Taste and add more butter, syrup, or spices as necessary. I recommend adding a smaller amount of the other ingredients at first and then adding more as necessary, especially if you are making a bigger batch. I'm hoping people like my side dish tomorrow! What are you making for Thanksgiving tomorrow?